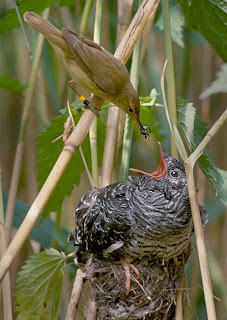 A mother reed warbler feeding her "adoptive"
A woman, driven to not raise her own child, leaves her baby in another woman’s nursery, killing another baby that is there and replacing it with her own. As soon as the transplanted baby is strong enough, it slowly, methodically kills all the other children in the nursery, hording all of the adoptive mother’s attention for itself. With time, it grows needier and more demanding, running the poor adoptive mother ragged trying to care for the monstrous child that had murdered all her own children. It may sound like the plotline of a horror flick, but it happens every year among several egg-laying species (granted, maybe without quite so much anthropomorphism and drama). Animals that lay their eggs among the egg clutches of other species and benefit from the “hosts” parenting their young are called obligate brood parasites. Like the creepy narrative above, the still-naked, recently-hatched offspring of many obligate brood parasites attack and kill the offspring of their hosts to ensure more parental attention. The researchers observed the nests of two common shiny cowbird host species: the house wren, a much smaller host than the cowbird, and the chalk-browed mockingbird, a larger host than the cowbird. For each nest, they either placed a combination of one cowbird egg and a few host eggs, or one cowbird egg and a few artificial eggs. When the eggs hatched, this resulted in some cowbirds having host “step-siblings” and other cowbirds being “only children”. When the chicks were 4 days old and 8 days old, the researchers videotaped each nest, and measured how much food each chick was getting fed and each chick’s weight and tarsus length (that’s the length of one of the leg bones and gives a good method to compare body sizes in birds). the smaller, redder gape at the top of the image is the cowbird. The other larger gapes belong to the mockingbird's own chicks. Overall, cowbirds grew to similar sizes at similar rates regardless of whether they were raised by mockingbird or house wren parents. But the presence or absence of nestmates had an interesting effect. Among cowbirds raised in mockingbird nests, cowbirds raised with nestmates faired far worse than cowbirds raised alone. Although mockingbird parents worked much harder and brought back more food to nests with more chicks (probably because the begging coming from the nest as a whole was much more rambunctious), cowbirds with mockingbird step-siblings had to share the provisions, whereas lone cowbird chicks got to eat everything the parents returned with. To make things worse, the mockingbird chicks grew faster than the cowbird chicks and they quickly outcompeted them. By the eighth day, cowbirds raised alone were larger and had higher survival rates than cowbirds raised with mockingbird step-siblings. This graph shows how much food the parents gave to the shiny cowbird chick, depending on whether the chick had mockingbird or wren parents and on whether it had nestmates (mixed) or was alone. The dashed bars show the total amount of food brought back to the nest for nests with nestmates. Notice that although nests with nestmates had the most food brought to the nest (dashed bars) in all cases, the shiny cowbird chicks with mockingbird parents got more food on day 8 if they were alone than if they had nestmates (solid bars) and the shiny cowbird chicks with wren parents got more food on day 8 if they had nestmates than if they were alone (solid bars). Graph from Gloag, et. al 2011 Behavioral Ecology paper. However, among cowbirds raised in house wren nests, cowbirds raised with wren step-siblings faired far better than cowbirds raised alone. 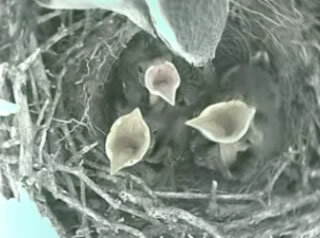 As did the mockingbird parents, wren parents worked much harder and brought back more food to nests with more chicks. The cowbird chicks grew faster than the wren chicks, and so the cowbirds managed to eat more than their fair share of provisions. Additionally, sharing a nest with nestmates can have other benefits as well, such as helping to keep warm. As a result, cowbirds raised with wren step-siblings grew larger than cowbirds raised without wren step-siblings. We don’t yet know whether obligate brood parasite chicks with multiple host species adjust their strategy (kill or tolerate) depending on the size of the host chicks, but this study suggests that they might. If you are interested in science, this may be a topic you could explore. At any rate, killing your siblings or step-siblings probably isn’t a wise thing to do. They can help encourage our parents to do more for us, they can keep us warm, and when they’re not looking we can “borrow” their stuff. Besides, birds don’t have the same morals, ethics and court systems that we do.